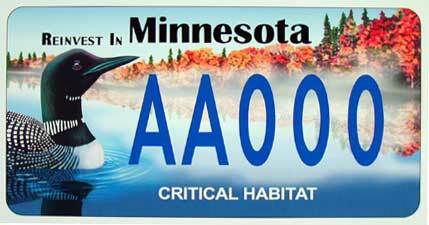 The Critical Habitat Plate was created in 1995 to provide an opportunity for citizens to contribute a nominal amount to conservation of Minnesota's natural resources, and show their commitment and individuality with a special vehicle license plate. 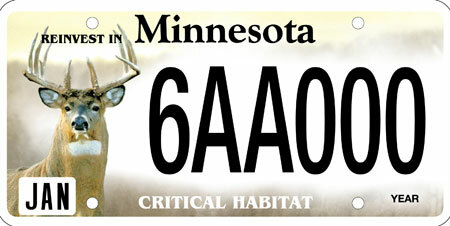 The critical habitat plate replaces the standard Minnesota license plate on your vehicle. 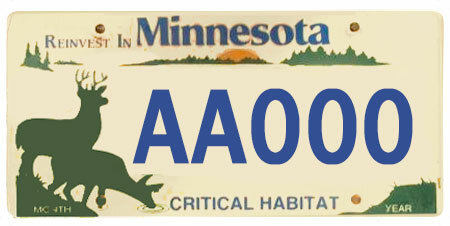 Show everyone you care about our state's natural resources by proudly displaying Minnesota's conservation license plate. With an annual contribution of $30 or more to the Reinvest in Minnesota (RIM) Critical Habitat Program, you will be helping to preserve important wildlife habitat and plant communities such as wetlands, prairies, old growth forests, and endangered orchid sites. Additionally, contributions over $30 go towards buying and managing important natural habitats, which are preserved as public lands. These lands are open to compatible public use, like hunting, hiking and wildlife watching. 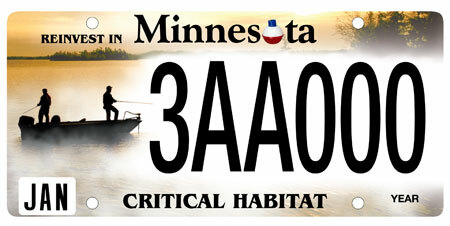 Order a Critical Habitat Plate today! You can purchase one right now - you don't have to wait until your registration is due! Fill out an application and bring it with you when you renew your license plate tabs. Call Driver Vehicle Services - Department of Public Safety at 651-297-3166. Thank you for your continued support of critical habitat! Call Driver and Vehicle Services (DVS) - Department of Public Safety at 651-297-3166. Click on images below to learn more about each plate. 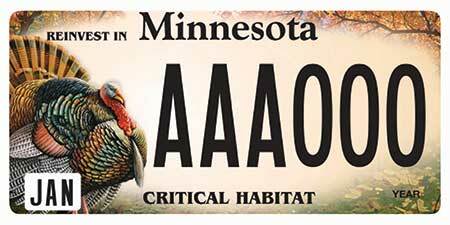 The new plate displays a colorful tom turkey and is the ninth critical habitat plate offered. 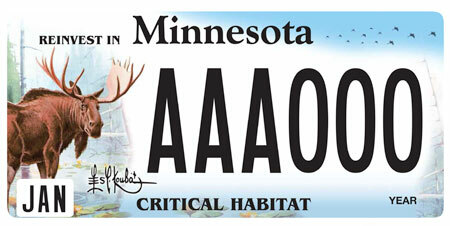 The moose plate features art by Minnesota wildlife artist Les Kouba. Moose in Minnesota are in trouble. A 50 percent decline in moose population since 2010 has left the iconic Minnesota animal in real danger of disappearing. Portions of the proceeds from sales of Call of the Moose artwork and licensed products support DNR moose management and research. The pheasant plate is an adaptation of the 2007 Minnesota pheasant stamp by renowned Minnesota artist Joe Hautman. License plate revenue will be used, in part, to support pheasant and other grassland species through Minnesota Prairie Plan habitat acquisition. Minnesota's state bird, the common loon, is more at home in water than on land. It serves as a symbol of the natural resources Minnesotans consider important - clean air and water. The loon's haunting and beautiful calls can captivate even the most casual outdoor enthusiast. Occurring from the Canadian border south to the Twin Cities, Minnesota has more loons than any other state in the U.S. except Alaska. 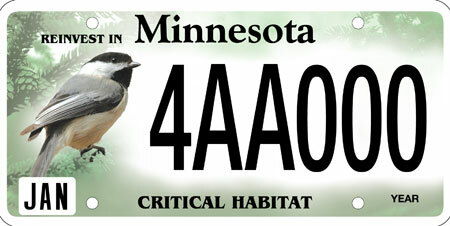 Some of the funds derived from the sale of critical habitat license plates are used by the Department of Natural Resources' Nongame Wildlife Program to help protect and manage loons and other nongame wildlife. The black capped chickadee was voted as Minnesota's favorite bird in a contest sponsored by the DNR's Nongame Wildlife Program. There are many qualities that endear this little bird to Minnesotans. It is a constant companion in forests, backyards, and woodlots throughout the state as it chirps its familiar "chicka-dee-dee-dee" call. Even on the coldest days of winter, when other birds have moved on to warmer climates, the hardy little chickadee is still visiting backyard feeders for suet and sunflower seeds. Minnesota's state flower, the Showy Ladyslipper, is a showstopper among our native wildflowers. It is one of Minnesota's 43 native orchids and it is probably the most well known. With its large but delicate pink and white blossoms, many flower enthusiasts consider it the most beautiful of all flowers in Minnesota. Minnesota's critical habitat matching fund can help preserve habitats that include the Showy Ladyslipper. 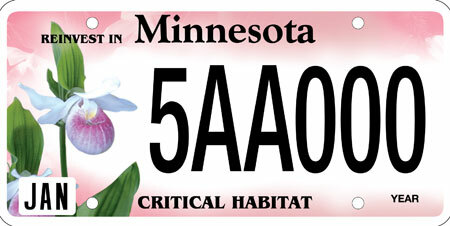 The use of the Showy Ladyslipper as a new conservation license plate design is a reminder that the Department of Natural Resources is dedicated to preserving the state's biodiversity and to managing natural habitats for all of Minnesota's wildlife and native plants. Fishing attracts 1.4 million licensed anglers to Minnesota's 11,842 lakes every year and one out of every five Minnesotans fish. Minnesota ranks fourth among states with the highest number of anglers, boasting the largest percent of resident anglers at 28 percent. In Minnesota fishing creates 43,812 jobs and generates $350 million in federal tax revenues and $342 million in state and local tax revenues, according to ASA's Sportfishing in America Survey. White-tailed deer are Minnesota's most abundant and popular big game animal. With a population approaching one million, Minnesota whitetails can be found near river bottoms and farm woodlots in agricultural areas, and in aspen/birch forests of the north. An important part of maintaining high deer populations is providing proper habitat, which the DNR purchases with funds from the Critical Habitat License Plates. The previous White-tailed deer plate will be available until supplies run out. 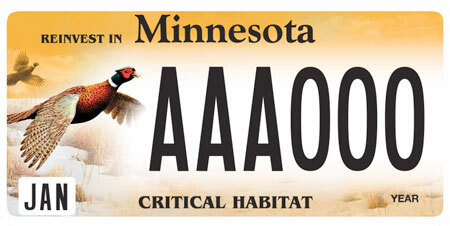 This plate currently adorns about 30,000 Minnesota vehicles.